The Medjay are mostly known only because of the blockbuster Mummy trilogy starring Brendan Fraser, or the most recent addition to the Assassin’s Creed franchise. And despite increasing interest in Ancient Egypt in recent years, the amount of knowledge most people have of them is minimal. In the Mummy trilogy, they still exist in the modern day, an elite band of warriors that has passed down their skill over the generations in order to protect the hidden treasures of the long dead pharaohs. However, while they no longer exist in modern times, their story and their history is much more fascinating than the small tidbits we learn when watching The Mummy. Over the years, what the Medjay were evolved greatly, becoming first the main mercenaries of Ancient Egypt and then their special police. Over time, their origins have become very blurred. However, the Medjay were originally an ethnic group that lived in Eastern Sudan, and were related to the ancient Nubians. The Medjay were greatly known for their military prowess and their skill at expanding their territory when they desired it. The kingdoms around them, such as the kushites, were both afraid of them and in awe of their skill. It was common to prepare your borders in anticipation of their strength, but also to hire them out as mercenaries for your own causes, which they were perfectly happy to do. While they originally started out as herders of livestock with great fighting skills, they eventually evolved into something entirely else. While they were hired out over the years by the Romans, the Kushites, and the Egyptians, their skills became so legendary that instead of a people, they eventually turned into an organization. This organization became the backbone of the Egyptians’ elite fighting force — one of the earlier examples of a conquered people being turned into something useful instead of being destroyed. The Medjay were originally more than just a people — they were a land and sort of a country of their own — but that changed over time, as the Ancient Egyptians saw increasing value in using the Medjay as an elite police force. At first the Medjay only specialized in helping the Egyptians with their more elite military affairs, and still had lots of jobs of various stripes throughout Ancient Egyptian society. However, as time progressed and their fighting and enforcing skills become more respected, their role became more specialized. Over time their role evolved so much to compliment their fighting abilities that they all were shoehorned into serving as Egypt’s special police force. Because of this evolution, the lines between who was an ethnic medjay and who was a medjay because they were with the police became increasingly blurred and almost impossible to distinguish anymore. While those who do know of the Medjay think of them as special guards for the pharaoh, they were also very important for day to day police work around the kingdom. Some historians believe that many ethnic Egyptians joined the Medjay over the years, in the hopes of achieving some of the same status and respect as warriors and police forces that the Medjay themselves enjoyed. Even today, when guns are easily the most popular weapon in the world, and most people consider them the top dog, archery can still provide a certain level of competition when it comes to deadliness and accuracy, even with all the technology that has gone into gun-making over the years. For any kind of people without advanced technology (many histories tell the story of warriors with incredible skill with the bow, who were able to utilize this skill to carry their people to many victories), the edge that a bow can give you in combat is unmistakable. For example, while many people tend to think of katanas as the most popular weapon among the samurai, their skills with archery were considered much more important for the time. In the ancient world, bows were simply the most powerful weapon, and in the early world, the Medjay were some of the most skilled archers and scouts around. While they also had skill with melee weapons, their excellent skills at archery probably helped catch the eye of the Egyptian authorities, who saw just how useful they could be as allies, instead of as enemies. Even today, silencing technology has nothing on the silenced power of a good bow — it is truly a weapon that will last through the ages. Recently a new Mummy film came out in an attempt to create another movie universe, similar to that created by Marvel, and that which DC is struggling to emulate. This movie universe would include classic characters like Dr. Jekyll and Mr. Hyde and the Wolfman, among others, and inexplicably starred Tom Cruise instead of bringing back Brendan Fraser — the man who was always the face of the Mummy franchise, and still is in the minds of many. While the new Mummy movie may have been a flop, the films with Brendan Fraser are modern B-movie classics, and introduced a group of guardians known as the Medjay. Many people who watched the movie may not have been sure how real these men were, but as this article, and history shows us, their role was real and they did indeed guard the tombs of the pharaohs, and really any other area that the Ancient Egyptian authorities thought needed guarding. However, there is no evidence that they had any particular magical knowledge or knowledge of magic, and there is no reason to believe they are still working as guardians in the modern day, as depicted in the movie. Unfortunately, at this point, the Medjay and their proud traditions have long since died out. 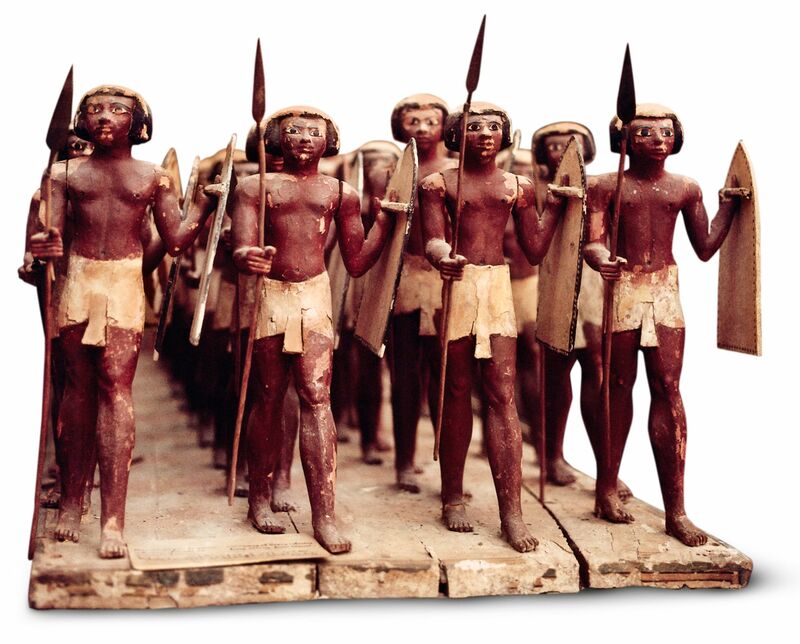 In terms of weaponry and tactics, we have little to go on from the period when the Medjay were still the Nubians, and after that, much of what they used was very similar to that used by the Ancient Egyptian army at large. While they were still very much Nubian people living on their own land, those who rebelled against the Ancient Egyptian powers had copper, but did not have tin and Egypt made sure none was imported, making it difficult if not impossible to manufacture bronze weaponry. However, the Nubians still fought bravely with fire-sharpened arrows at range, and at melee range, they would sometimes use maces or short javelins with copper tips and puncturing bits. After they became more integrated with the Ancient Egyptian military, there is some evidence that they finally got their hands on bronze weapons, and had some new weapon preferences with the new materials available to them. There is not a lot from the time period, but what we know suggests that they got their hands on bronze long spears and bronze penetrating axes, and added them to their already considerably dangerous repertoire — on top of likely taking up the composite bow over the recurve. Their deadly skills only became more apparent as the Egyptians shared their technology with the Medjay who had joined up and became part of the new kingdom. Over the years, as the Medjay became more of a part of the Egyptian fighting force than a people, their burial practices slowly died away and were replaced by more traditional Egyptian burial methods and traditions. As we know, the Ancient Egyptians had very complicated procedures that including mummifying the body in order to properly preserve it for the next life. As far as the Ancient Egyptians were concerned, the next life was not the end, but the beginning of an entirely new journey. However, until they started to disappear as an actual people, the Medjay had their own distinct burial traditions. Historians and archaeologists have found, in the areas near where the Medjay once lived as a people, remains of graves that they are certain to belong to the elites that once fought against, and eventually for the Egyptians in ancient Nubia. These graves have been referred to as “pan graves” due to their unique shape. 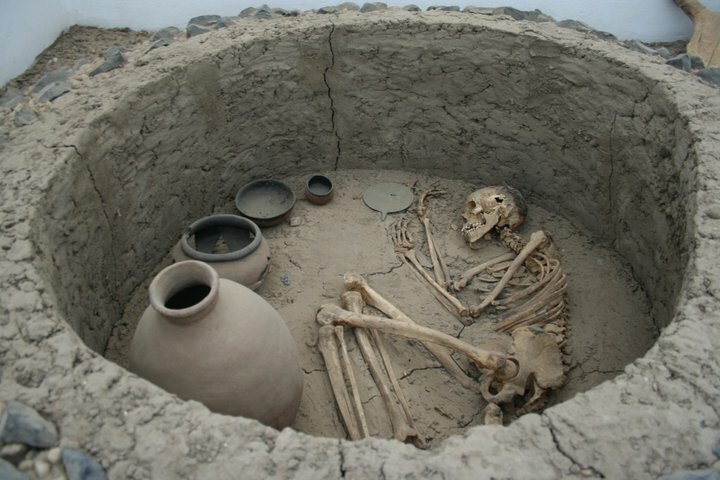 The graves tend to be shallow and circular, looking sort of like a frying pan shape, and often have red topped pottery bowls in the center, as well as other items such as cow horns. The bodies were usually wrapped in leather before burial and sometimes contorted in strange positions — perhaps to make them fit better, but the true reasons may be lost to history. Like the Ancient Egyptians, they did often bury jewelry, weaponry and other similar items, so they may have also believed that there was a separate journey after death that we need to be prepared for. As we mentioned earlier, the Medjay took many forms throughout history, and some were very different from others. Scholars have had trouble piecing it all together, because there is not much to go on, but there are a few things that most historians believe are likely true. The people called the Medjay likely started out as a group of Nubians from a land called Medjay that was part of Nubia. The people the Ancient Egyptians referred to as the Medjay may not have been entirely one single ethnic group, but could have been partially stereotyped by the Egyptian authorities for their own reasons. While they did become a fighting force, it is likely the people living in the land of Medjay assimilated to Egypt when they saw that Nubia was going to lose any kind of protracted conflict. As we mentioned briefly earlier, they did not start out as an elite police force, but actually did all kinds of odd jobs in society at first. Before long, their skills at combat became apparent and first the special police force, and then special designations in the army, grew from their initial activities within the empire. As time passed, many who were not Medjay ethnically wanted to join this elite force, and likely any kind of mixing between the two races blurred the lines even further. This led to it becoming a designation as an elite paramilitary force, instead of as an ethnic group of people — by this point, the Medjay as an ethnicity had all but vanished from the face of the Earth. Today, police forces around the world have all kinds of advanced technology, but for some officers, having a trained dog around to help them is something that no technology will ever be able to replace. And while some theorists like to suggest that the Ancient Egyptians had advanced technology, even if they did, they agreed with the police forces of today that there was nothing like having a properly trained animal by your side. In the Ancient Egyptian police forces, which were comprised mostly of Medjay or those who became Medjay by name for joining, the use of trained animals was not at all uncommon — likely just as common (or more) as trained police dogs today. The Medjay, in their role as police, would carry staves as their main weapon — something that would be useful to keep range from disgruntled people, while being non-lethal, at least in most situations. And while they often had trained dogs, they also (although much more uncommonly) had trained monkeys in order to assist them in their work. While there is some debate about where they initially hailed from, trained monkeys for civilians as well are something that we know existed within Ancient Egyptian culture. While some people may not think of monkeys as a particularly great companion for protection when you need help, they can be quite vicious and dangerous when they feel threatened. While the Medjay’s main role was to police the kingdom and even go out and protect outlying treasures or tombs, they also had even more specialized roles that only the most elite could undertake. The Medjay’s most skilled and loyal warriors were assigned to be members of the pharaoh’s personal bodyguard, a position of great trust and respect. However, even while the Medjay were given the most important positions in terms of what they guarded, there is evidence that until they were fully integrated and assimilated, the Ancient Egyptian authorities never fully trusted the Medjay with any real power. Before the Medjay were fully assimilated, the position of chief for various parts of the kingdom, as well as the deputies appointed, were usually of fully Egyptian ethnic origin. This shows that while the Ancient Egyptians believed highly in the fighting skill of their once-foes, they always feared the potential of the Medjay somehow rising up against them, taking over from within through leadership positions or causing some other kind of trouble to the already established power structure of the old kingdom of Ancient Egypt. Perhaps they were wise to do so, however, if their conquered enemies’ skill was great enough that even as the ethnic lines became blurred, they were still called upon for the most dangerous and important jobs… as long as they didn’t get to be in charge, of course. Assassin’s Creed is an incredibly well known franchise that originally took the gaming world by storm for its completely unique gameplay and storytelling. Unfortunately, the games seem to be pumped out at an alarmingly faster rate every year, and it begs the question of how they can expect to maintain proper quality at that pace. At any rate, the main draw of the Assassin’s Creed games is how they weave a historical fiction involving their conspiracies of Templars versus Assassins, that seems like it could be realistically believable. In the very first game, the realism of the setting and the way you could almost feel yourself reliving ancient history was an awe-inspiring experience most gamers will never forget. However, as they widen the scope of the games and attempt to keep at least a little originality from one version to the next, they sometimes reach into history that very little is known about, and fill in a lot of the blanks themselves. The most recent Assassin’s Creed game, Origins, revolves around Bayek – a Medjay who (game spoiler… even though, seriously – it’s right there in the title) helps form the Brotherhood of Assassins. In this storyline, the Medjay’s symbol is the eye of horus, and while it sounds really cool, we could not find any historical evidence that says anything about any special symbol at all, and nothing specific about the eye of Horus — apart from sources talking about the game itself. While this particular factoid may not be true, the Assassin’s Creed franchise has no need to embellish to show how cool the Medjay of Ancient Egypt truly were.